Maithripala Sirisena’s ascent presents an historic opportunity for democratic rejuvenation in Sri Lanka. Sri Lanka’s remarkable presidential election on January 8 has restored its image as one of Asia’s oldest, most resilient democracies, rather than a failed one. The peaceful, rapid transfer of power from President Mahinda Rajapaksa to the country’s new leader, Maithripala Sirisena, shocked most experts. Sirisena defected from the president’s own Sri Lanka Freedom Party (SLFP) but ran as the “common candidate,” representing opposition parties from across the political spectrum that coalesced to challenge Rajapaksa’s autocratic rule. That President Rajapaksa would find a way to stay in power “by hook or by crook” was the dominant view throughout the election campaign, but in the end those fears proved largely unfounded. Rajapaksa is rumored to have floated the idea of declaring a state of emergency and canceling the result when it became evident the count was not going his way, but the attorney general, police, and armed forces refused to go along. Whatever last-minute tomfoolery went on, Rajapaksa stepped down and Sirisena was sworn in as the new president the day after the poll. He promptly appointed Ranil Wickremesinghe, leader of the main opposition United National Party, as the new prime minister. For the first time in its history, Sri Lanka will have something like a national government. The moment is ripe with opportunity for repairing a tattered democracy and furthering post-war reconciliation. Sirisena won for three reasons. One, key institutions responsible for ensuring a fair election — the election commission, civil service, police and even the armed forces — remained neutral in a close contest. The conventional wisdom was that the Rajapaksa clan — his three brothers and eldest son — had captured every government agency of consequence and made them instruments for furthering the family’s rule. Instead, most institutions, barring the state media, stood their ground and refused to be complicit in stealing an election. Second was the growing public outrage over nepotism and corruption that came to define Rajapaksa’s rule, eclipsing his image as the leader who saved the country from the terrorism of the Liberation Tigers of Tamil Eelam (LTTE). The government crushed the Tamil Tigers in 2009, after a vicious civil war marked by direct attacks on civilians and suicide bombings that claimed thousands of lives on both sides. But public gratitude for winning the war was giving way to apprehensions about one family controlling all the levers of power. The campaign was filled with dark threats that the Tigers would be resurrected if Sirisena came to power, but many voters, including Sinhalese, saw through this fear tactic. Honesty, morality, and the rule of law are not incompatible with national security. Third, Rajapaksa wrote off the minority Tamil and Muslim vote and pandered to the Sinhalese majority. Tamils and Muslims together comprise a quarter of Sri Lanka’s electorate. After his brutal crushing of the rebellion, Tamils were overwhelmingly against him but Muslims have been more divided. 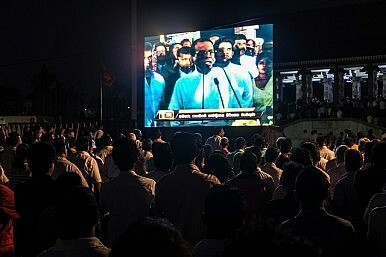 Many voted for Rajapaksa in the last two elections but this time he comprehensively lost the Muslim vote because the government appeared to tacitly support a Sinhalese supremacist group — the Buddhist Power Force or BBS — that attacked Islam as an alien religion and provoked anti-Muslim violence. By relying solely only on the Sinhalese vote, Rajapaksa was vulnerable to a candidate like Sirisena with similar “son of the soil” credentials necessary to win a substantial share of the Sinhalese vote, along with all the minority vote. In this still fragile situation, Sirisena faces two major challenges. He has promised to reverse the Rajapaksas’ imperial ways by restoring checks and balances on the presidency, and introducing a culture of accountability and public service in his first 100 days. However, promoting reconciliation between Tamils, Muslims, and Sinhalese after the horrific excesses of the civil war will require equal if not more political skill and far greater courage. Rajapaksa believed that spending money to rebuild the war-devastated Tamil- and Muslim-dominated north and east would be enough to improve ethnic relations. But that did not account for the deep-seated grievances that led to the conflict, nor the alleged government atrocities committed during the final battle. Tamil leaders wanted more devolution of powers to the regions, the withdrawal of soldiers from the north, and an independent UN investigation into the final phase of the war when thousands of civilians died in the cross-fire and LTTE cadres that had surrendered were reportedly killed. In a calculated political move, Sirisena ruled these out during his election campaign. Pressing him on these issues now will quickly lay bare the ideological divisions of his disparate coalition and expose its fragility. For the moment, he can take smaller measures that may be more broadly acceptable and still change the tenor of ethnic relations for the better. For example, implementing the recommendations of the imperfect but “home grown” Lessons Learnt and Reconciliation Commission (LLRC) more vigorously than Rajapaksa did; accelerating the investigative work of the commission on missing persons; and repudiating violence against the Muslim community. But at some point Sirisena will have to come to grips with the one issue that vexes Sinhalese-Tamil relations more than any other — the number of civilians that died during the army’s final push to destroy the LTTE. A preliminary UN investigation in 2011, the Darusman report, stated that as many as 40,000 civilians may have died but that a full, impartial investigation was required to know for sure. An honest accounting of the human cost, one that separates civilians from combatants, is vital for reconciliation. Sirisena, who promised in his inaugural speech not to run for another term, appears determined to use his presidency to revive Sri Lanka’s democracy. The rot did not set in with Rajapaksa alone; three presidents before him, going back to 1978, are all culpable and were corrupted in one form or another by wearing the ring of unbridled power. Sirisena should not shirk the equally difficult task of advancing reconciliation. If he seizes this opportunity, and has the self-assurance to understand that this moment is one of his own making, this modest man from rural Sri Lanka could leave a legacy that overshadows all of his predecessors. Nilan Fernando is currently the country director of Mercy Corps in Myanmar. He was country representative of The Asia Foundation in Sri Lanka from 2003 to 2013. The views expressed are his own.